stupid name i know, but how could i not!? i get asked a lot about the simple recipes i share on instagram stories so i thought i would try to start sharing them more often like i used to! i wasn’t planning on making this one a post, obviously– because i took one photo of it, but i thought i might as well post it because otherwise i’ll talk about doing it in the next few weeks and that’ll turn into months and then i’ll forget. so one photo it is! we looove (verde) chilaquiles, i mean i order it anytime it’s on a menu anywhere basically, but as you probably know i’m not one for doing anything too ambitious, so the concept of making my own tomatillo salsa from actual tomatillos that you would buy and then put in a food processor is just not really ever going to happen. or if it does, i’ll do it once and talk about how i did it that one time and it was time consuming af. but this method is so simple you could basically do it every weekend! it takes like 20 mins! a few months ago i just whipped this up randomly and we loved it so much i’ve made it a few times since. unfortunately when i create my own recipes, the portions/temperatures/etc are all sort of up in the air and open for you to use your best judgement. in a large bowl, mix the tortilla chips with the onion salsa mixture and get it all really wet. 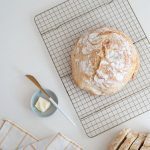 lay out flat into your baking sheet (ps here’s the link to mine). sprinkle some of the cheese and place in the oven for 18 minutes or so. until it looks like, cooked lol. i asked gid how to word that better and he suggested “until the cheese is melted and the edges are golden brown”, that sounds better. 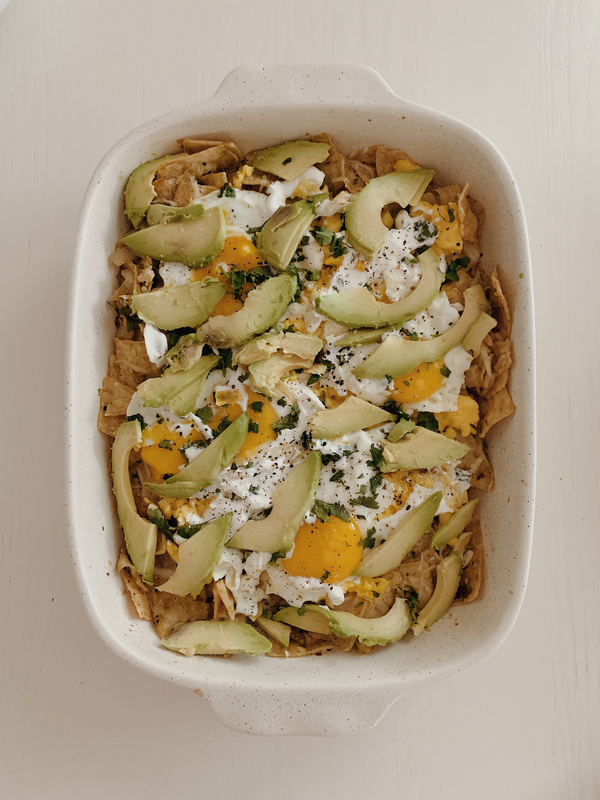 take the baking dish out of the oven and top with the eggs, sprinkle with cilantro, salt and pepper and top with sour cream and sliced avocado! *i also made this in a smaller baking dish for just me and gid by basically just halving everything. would love to know if you try this out! enjoy. Next Next post: baby on board — car magnet!